Barford St Martin is one of the villages in the Nadder valley to the west of Wilton. 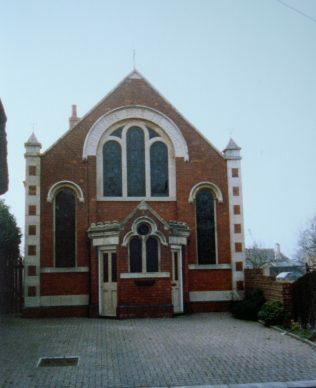 The Primitive Methodist chapel on West Street is no longer in use but clearly proclaims the date 1902 in the arch over the central window. There is a bit of confusion in the the notes with Keith Guyler’s photograph which say that the chapel was opened in 1869 and closed in 1902; it appears his notes relate to a previous chapel. The Wiltshire Community History website says that “By 1830 a group of Primitive Methodists were meeting here and were strong enough to build a chapel. A certificate for a meeting house was issued in 1931 and they continued to meet here. In 1932 both branches of Methodism, Wesleyans and Primitives, united and this became the Barford Methodist Chapel. It is no longer in use.” Is the 1931 date inaccurate? On Google Street View in June 2011 it is in use as a house.